The Gowise USA Pressure cooker review shows they come in the sizes 4 and 6 quart and it is just a personal choice depending on how large of quantities you are cooking if you should go for the 4 or 6 quart version. The technical aspects are the same for both. There is a pressure regulating knob to go form low to high pressure and we will discuss this feature later. The cooking pot is made out of aluminum and has a Teflon non-stick coating. If you prefer a Stainless steel cooking pot you can buy that here. ==> Stainless steel 6 quart cooking pot <== In this Gowise USA 6 in 1 pressure cooker review we will discuss all the pros and cons of this electric digital pressure cooker. Read everything we found out about the Gowise pressure cooker and why we gave it the rating we think that reflects the real facts. All together is has 10 pre-settings and this makes me wonder why to call it a 6 in 1 at first but then I looked at the possible use and you can use it as 6 devices. Steamer, rice cooker, saute, slow cooker, warmer and pressure cooker. The temperatures is basically in 4. around 350 for browning and saute, pressure cooking goes from 240 to 246 and the slowcooker is about 180 degrees. The warm-hold temperature is around 130. I had to dig deep, but found that it is 1000 Watts. The Gowise usa is made out of a stainless steel outer body and the lid is also made of stainless steel. The cooking pot is made of aluminum with a non stick teflon coating. If you prefer a stainless steel cooking pot look at the link in the intro we made to one on Amazon. 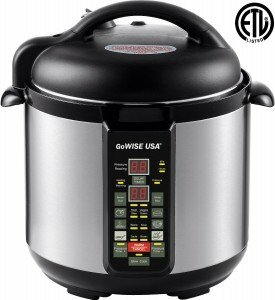 The Gowise pressure cooker is ETl approved and this means that it tested and approved safe to be sold in America and Canada. The other safety measurements are a self locking lid and antic blocking cage for the pressure safety valve. This means that the pressure release safety valve never can get blocked by food particles. “I really like it and have made two recipes so far with it and my family enjoyed everything. I would give 5 stars but I have had real difficulty getting the lid on and “locked”. It might be operator error on my part and perhaps I will “get” it all at once and be able to make it work quickly. Like always we do a full pressure cooker pros and cons for the Gowise USA electric pressure cooker to make it easy for you to decide if this is the right one for your style of cooking. The quality inspection before they leave the factory could be approved because we see a little higher return cause by faulty products than in other pressure cooker reviews. Buy a pressure cooker cook book with it. Best practice is an also to avoid you have to look for gowise pressure cooking troubleshooting is to follow the gowise usa pressure cooker manual that came with your purchase. This manual will tell you all about how to use gowise pressure cooker and answers all your questions. Read our ==> pressure cooker cookbook reviews <== to find the right one for your cooking Read all our electric pressure cooker reviews here.